In memory of our baby Kyle: Oct 24, 2011 - Nov 8, 2011. We had 15 days with him. This is a summary of week 2. If you havn't read my recap of Week One, read it first. Mike and our daughter left on Sunday night to go home, while I stayed in Toronto. I already had a hotel room booked at the Delta Chelsea for this week, since originally I was supposed to have baby on Nov 1st by planned induction and I had booked it as a place for Mike to be able to sleep for the first couple days before I would be discharged, and then for me to join him. The hospital and the hotel are only a block apart from each other which is really helpful. The weekend had been hard, as I described in the previous post, with dialysis lines inserted, dialysis started and stopped, and ammonia levels spiking high. They had also attached Kyle up to a fancy EEG machine over the Sunday and Monday for 48 hours to monitor for the potential of both convulsive and non-convulsive seizure activity from the high ammonia levels that had occurred on Saturday. Apparently Sick Kids is the only hospital in Canada to have this machine - it has many more electrical leads on it than a typical EEG machine. First day back home for the day ... its a bit of a blur. Feels like yesterday I left with +Cindy Babcock, but its been a week. While I was there it felt like forever, like months were passing, watching him get hooked up to so much equipment and have so many people figure out how to best care for him. Its surreal now that I'm not there, trying to imagine now what I know I experienced all week. Cindy's still at Sick Kids with Kyle trying to be strong, Natasha's here with me excited about Halloween tonight. Its two different worlds, and yet they're both happening right now. I met with many doctors and support staff that day. If I was in the room, there was someone there waiting to talk to me. If I left to drink or eat, I came back to messages that people had come in looking for me. I spent so many hours talking to staff that day, that I had to sit and start writing stuff down. I'm usually quite good at remembering things, but it was overwhelming. I'd also forgotten it was Halloween, and after talking with the lactation consultant who had what looked to be a police or army uniform on, I confusedly asked her if she was part of the Salvation Army? That was the only thing I could think of as to why she would have this odd uniform on! Nope, just Halloween! A week of general antibiotics had just ended, which had been given as a precautionary measure against potential infection because he was so little, but that day they found E.Coli in a urine sample. A kidney was enlarged as well, they suspected the E.Coli infection caused the enlargement. New antibiotics to treat the E.Coli infection were started. None of us realized at the time how bad this infection would turn out to be. Ammonia levels were creeping back up, and the metabolics genetics team were concerned about the levels creeping back up and the potential cyclical cycle of needing dialysis. They ordered a special TPN mixture (Total Parenteral Nutrition) in from the States that contained only essential amino acids and no non-essential amino acids, because the TPN mixture he was on was not being tolerated by his system well since it had too much protein in it with the non-essential amino acids in the mixture. The special TPN mixture had to be approved by Health Canada, and once approved would be MADE in the States the next day. Feeding had not been going great the previous week, which they put down as being because he was still slightly preemie with digestive tract not completely/fully developed yet. They were feeding Kyle a "whopping" 2ml/hour of low protein formula, but he wasn't digesting it well, because of being small. They were starting him on domperidone to help with digestion. The rest of his food was coming from the TPN mixture, along with IV drips of glucose and lipids (fats). 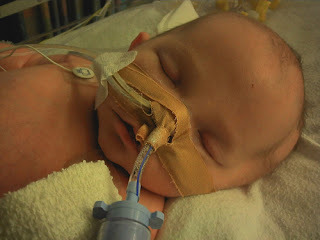 On the Monday, Oct 31st, they brought his formula feeding down to 1ml/hr through the NG tube. The doctors did an ultrasound of the brain and could see swelling, and ordered an MRI for the next day to see more detail. On Tuesday, on top of the E.Coli being found in the urine, they found an infection/growth that had started in the PICC line. Ugh. Neurology came back with results from the 48 hour EEG monitoring from the weekend, but no seizures were found on it. This was really good news in my opinion, since it meant the high ammonia hadn't caused any neurological damage. In retrospect, if only that was all we had to worry about. In reality, the E.Coli infection had already started to cause damage on it's own...and it affected a different portion of the brain causing more damage than the ammonia would have. Ammonia levels had continued to go up over night and through the day on Tuesday. Dialysis was started again. It did bring the levels down quickly, but the machine clotted, and they had to stop the dialysis after a few hours. The MRI didn't end up happening on Tues, there was a backup of people waiting to use it, so it was booked and done on Wednesday. On Wednesday afternoon, they asked if Mike could come come back to the hospital so that the doctors could meet with both of us together later that evening. Never a good sign. Mike left work early, dropped Natasha off a relatives along the way, and made it down for our meeting. Thank goodness I had one of my friends with me that day visiting. I was a mess. Once Mike arrived we met with the metabolic and PICU doctors. The doctors were highly concerned because of the infection. It had developed into full septic shock, and Kyle was already on the highest dosages of blood pressure medication they could give him. They didn't know if the infection had already hit it's peak or not. If it hadn't and if it was going to get worse, they feared there was nothing else they could do, because they couldn't give any more medication for blood pressure. Their fear was that if the infection had not reached it's peak, and the blood pressure got worse there would be nothing they could do because they couldn't increase the blood pressure medication. They were also concerned about the swelling in the brain that they could see from the MRI. They knew based on where the swelling was (base of brain stem and basal ganglia) that it was caused by the infection and not from high ammonia. They were hopeful that the swelling would reduce, but it would have to be a wait and see situation. We were told that treatment for the E.Coli infection/septic shock was a three week treatment of heavy duty antibiotics. I remember gasping when I heard three weeks...that is what cemented how serious everything was to me, since I've never heard of antibiotics being used for that long at once. Kyle was taken off the transplant list on the Wednesday night because of the infection. I had assumed that this meant he would be off the list for the full three weeks while treating the infection, but I learned later that as long as the infection was shown to not be getting worse he could be put back on the list. On Thursday, the special TPN mixture that had been specially made in the States on Tuesday arrived. It had got held up at the border on the Wednesday and it took some behind the scenes work by the metabolic doctors to get it through customs. Amazingly, this mixture did the trick, and ammonia levels kept low once this mixture started to be used. The infection seemed to have leveled off and not got any worse, and over the next few days they were able to reduce the blood pressure medication until he was taken off all blood pressure meds. He was considered stable over this time, and blood work showed that the infection was starting to clear up based on blood cell counts. Although he wasn't getting worse, he wasn't getting any better either. He hadn't been awake or been able to open his eyes since the dialysis tubes went in on Saturday. He was responding a little bit, but not a lot, to touch, and was only moving his arms and legs on rare occasion. What we didn't realize is that normally babies start trying to take the breathing tube out after a couple days, and he hadn't tried to. The doctors were really hoping that he would start responding more, and ideally, try to take the tube out to show that he was responsive. On Friday, transplant had him weighed. He weighed in at a whopping 9 lbs (from birth weight 12 days before of 5lbs 5oz), because he was SO swollen up with all the fluids/IV's they were giving him. Transplant includes this swollen fluid/extra weight as normal weight. Transplant co-ordinator told us that since the infection was decreasing, he could be put back on the transplant list as soon as it was approved by the transplant surgeons. Transplant surgeons decided they needed to wait until he showed signs of more responsiveness before putting him back on the list, since they were worried about potential neurological damage. Saturday. Swollen from all the fluids. On Saturday, we realized why they had weighed him. We havn't been told this officially, (and due to privacy reasons I'm sure we won't be told), but we're pretty sure it's because they knew a liver was coming available and wanted to see if Kyle was big enough as well as healthy enough to be put back on the list for this possibility. On Saturday, in the late afternoon they brought in a young baby, maybe only a couple months older than Kyle, who had just had a liver transplant into the bed space across from us in the PICU room Kyle was in. We're not supposed to know medical conditions of the other children in the room, but, a) the surgeon's name was listed as his doctor on the wall outside the room and it's the same doctor we had been dealing with, and b) I overheard one of the nurses telling one of the other staff that he had just had liver transplant. I'm pretty sure in retrospect that had the infection not set in, causing the permanent damage it already had, that Kyle would have been transplanted that day. A close up picture from Saturday. By Saturday night I was getting quite concerned. That he hadn't opened his eyes in a week, and wasn't responding enough. Seeing the other baby come in and realizing he had been transplanted, and that he was alert and moving around even right after surgery, was more than hard. That night I took a look at a blog that I had bookmarked (there's a link on the side of this blog for it) of a family in the States who had a boy earlier in the year with a severe mutation of OTC, who had since been transplanted to see where they were at in the same time period. 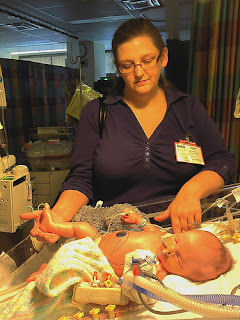 The pictures showed the baby awake, alert, and with no breathing tube, and this was after having had a severe hyperammonemic episode in his first couple days. At this point, I knew we were in trouble, but tried to remain hopeful. The next post will be about the final couple days and beyond. Thank you so much for sharing your precious son's life with us. He is such a beautiful baby. Your family is in my thoughts and prayers.